You are here: Home / Crafts and Charity / Illinois and Nebraska! 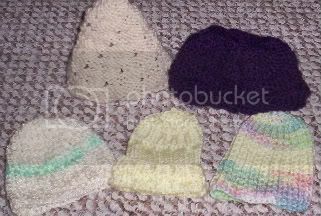 Items 1-5 = my first preemie hats. The back 2 are a little bigger and may be suitable for “regular” sized babies…but anyway, these will be headed to Robyn for her drive. These also represent my Nebraska charity! 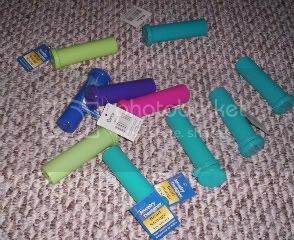 They are bead holders, and they have little lids at the top. They’re even Easter-colored, kind of!! 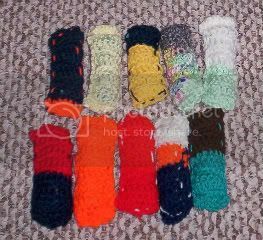 So, I filled up 10 of these little tubes with beans and then crocheted around them. I hope these are okay! Wow, Margie you’re so busy and productive! That’s awesome and your hats and toys are adorable. Way to go! Thank you so much, Kate! I’ll add it!